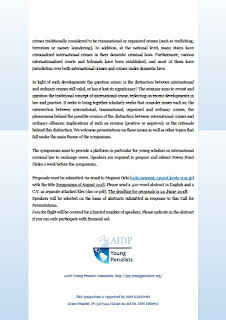 The programme for tthe 6th AIDP Symposium for Young Penalists is now public. The materials will be open at this page. The demarcation line between international crimes and ordinary crimes is becoming vague. At the international level and at the International Criminal Court (ICC) specifically, the formal distinction between ordinary and international crimes is being challenged. In 2013, in the context of the situation in Libya, Pre-Trial Chamber I of the ICC confirmed that the ICC Statute does not make a distinction between ordinary and international crimes when it comes to the complementarity regime of the ICC, and domestic investigations for the same conduct are sufficient to make the case inadmissible before the ICC. At the substantive level, the demarcation line between crimes against humanity as a category of international crimes and ordinary offences took center stage in the decision of Pre-Trial Chamber II to authorize an investigation into the situation in Kenya in 2010 and is has remained a contentious aspect since. More recently, in 2017, the Appeals Chamber confirmed that members of an armed group are not per se excluded as potential victims of war crimes of perpetrators belonging to the same armed forces, which may seem incompatible with the concept of war crimes and international humanitarian law. At the regional level, the Malabo Protocol adopted by the Assembly of the African Union in 2014 created a new International Criminal Law section in the African Court of Justice and Human Rights and conferred upon it jurisdiction over core international crimes (genocide, crimes against humanity and war crimes) as well as other crimes traditionally considered to be transnational or organized crimes (such as trafficking, terrorism or money laundering). In addition, at the national level, many states have criminalized international crimes in their domestic criminal laws. Furthermore, various internationalized courts and tribunals have been established, and most of them have jurisdiction over both international crimes and crimes under domestic laws. In light of such developments the question arises: is the distinction between international and ordinary crimes still valid, or has it lost its significance? The seminar aims to revisit and question the traditional concept of international crime, reflecting on recent developments in law and practice. It seeks to bring together scholarly works that consider issues such as: the intersection between international, transnational, organized and ordinary crimes; the phenomena behind the possible erosion of the distinction between international crimes and ordinary offences; implications of such an erosion (positive or negative); or the rationale behind this distinction. We welcome presentations on these issues as well as other topics that fall under the main theme of the symposium. 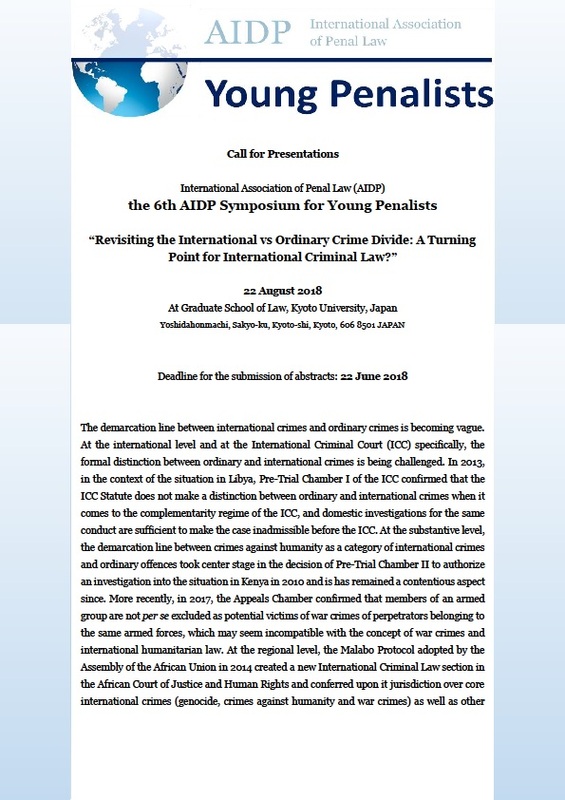 The symposium aims to provide a platform in particular for young scholars in international criminal law to exchange views. Speakers are required to prepare and submit Power Point Slides a week before the symposium. 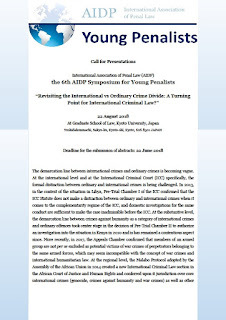 Proposals must be submitted via email to Megumi Ochi (ochi.megumi.74s@st.kyoto-u.ac.jp) with the title Symposium of August 2018. Please send a 500-word abstract in English and a C.V. as separate attached files (doc or pdf). The deadline for proposals is 22 June 2018. 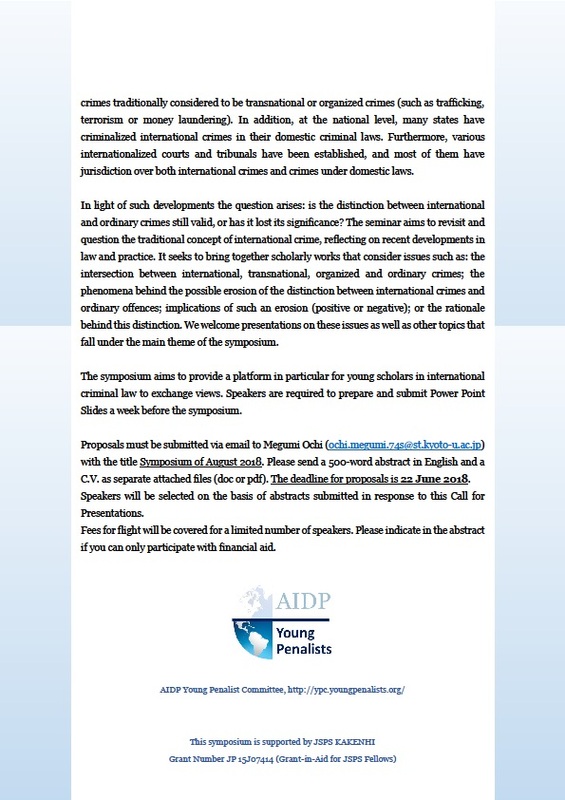 Speakers will be selected on the basis of abstracts submitted in response to this Call for Presentations. Fees for flight will be covered for a limited number of speakers. Please indicate in the abstract if you can only participate with financial aid. 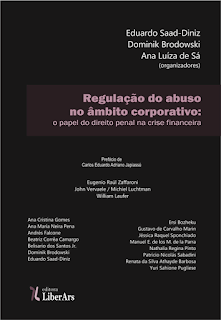 Eduardo Saad-Diniz / Dominik Brodowski / Ana Luíza de Sa (editors), Regulação do Abuso no Âmbito Corporativo, LiberArs 2015. ISBN: 978-85-64783-78-2. Este livro é resultado de IV Simpósio de Jovens Penalistas da Associação Internacional de Direito Penal (AIDP), realizado em São Paulo, entre os dias 23 e 24 de agosto de 2014, e é organizado por três jovens e brilhantes doutores, Eduardo Saad-Diniz, Dominik Brodowski e Ana Luíza Barbosa de Sá. Na ocasião, o Simpósio contou com a participação de jovens penalistas e de outros especialistas na matéria do direito penal econômico e das empresas provenientes das Américas, da Europa, da Oceania, da África e da Ásia, que permitiram uma rica discussão, sobre o papel do direito penal em um mundo globalizado e em crise, como o que se tem visto e vivido desde 2008. Com representantes de todos os continentes, pode-se dizer que foi possível produzir uma efetiva visão global sobre o tema. More information on other language options will follow. Every June, the various AIDP administrative bodies meet in Paris to report on past dealings and to discuss the way forward. For this years' meetings which just concluded, several substantial changes and improvements to the scientific and publication strategy were discussed and approved - with many of these changes making AIDP events and activities even more valuable for Young Penalists. Five members of the Young Penalists Committee actively contributed to these meetings with a view to enhance Young Penalist involvement in all aspects of the life of the Association. More information on the new AIDP strategies - and on future AIDP events - will soon be published on the AIDP website. But for information with specific relevance for Young Penalists, keep visiting this website - we will have much to report soon!